Blenders are handy tool for the kitchen. In some cases, they are precarious as well to the users. That’s why, blenders with safety features are in top demand now a days. Would you like to have a UL-certified blender that ensures your safety? Today I am going to review COSORI 1500 Watt Professional Blender. Holly smoke this blender is an excellent piece of kitchen appliance. I haven’t found anything like this blender before. And you know it’s a huge cost saving blender in comparison to Vitamix vs Ninja. I’m very much fascinated with this blender. Though its design and features are similar to the high-value Vitamix, it is a very powerful and functional blender in reasonable price. Note that, if you are looking for a high-end and regular usable blender for your kitchen, then COSORI is one of my favorite blenders. 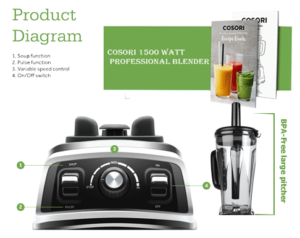 Because COSORI 1500 Watt Professional blender is a high-powered ice crushing and commercial juicer blender. 1500-watt power motor easy to crush and pulverize solid foods and ice within seconds. Built-in soup function can create warm and nutritious soup without cooking on the stove. BPA-Free large pitcher capacity for blending a large number of ingredients. Its spill-proof lid easy to open and lock. Dishwasher safe and easy to clean with its cleaning brush. UL-certified Motor base armed with automatic overheat protection ensures product safety and longevity. The smart power safety technology keeps off the machine if the pitcher doesn’t fit properly or cord is unplugged suddenly. The blender includes an additional tamper, cleaning brush, a pro recipe book and a 27 Oz travel bottle. Let’s see the quality and capability of COSORI 1500 Watt Professional Blender. COSORI Professional 1500-watt blender motor is alike the motor of Breville boss. It has 30,000 RPM crushing performance system that can blend anything quicker than other blenders. Since it is a powerful blender, it doesn’t create loud sound. Its lid and Pitcher are easy to remove and put on. If the machine gets overheated or the pitcher becomes loose, then the smart power safety technology will shut off the motor automatically. Most blenders lack the speed controller system. For that reason, you have to use the on/off button every time so that it doesn’t get overheated. But COSORI 1500 Watt Professional blender is different in design. It has one pulse and a manual speed dial controller system. You don’t need to hit the pulse button every time. By using the dial button, you can control the blending speed and ingredients perfectly. It also includes a soup button. By using this you can make a warm soup without a stove. The COSORI pro blender has a large and thick pitcher. Its 64-ounce BPA-free plastic jar is enough for a family. It can blend any complex ingredients without causing any trouble. The pitcher is easily detachable from the base. If you are making pudding and frostings, you can easily put them out with a rubber spatula. Otherwise, you will face an irritating situation. You can carry a certain amount of smoothie and juice anywhere with its 27 Oz travel container. Its 6 blade technology system is made of stainless steel. It is also able to crush ice into the snow without mixing water, frozen fruits, veggies, seeds and other hard ingredients. You can use its custom tamper to push larger and unmixed foods towards the blade. Enough power for crushing any ingredients. Capable of making hot soup and sauce. The pitcher is larger than other blenders. Dishwasher safe plastic jar and bottle. A thick 6 stainless steel blade can crush any hard ingredients. Super quiet and does not sound sharp at all. Easy for usable and clean. It is 20 inches long. That’s why, it may not fit into some kitchen countertops with cabinets. What things this COSORI blender can blend? COSORI 1500 Watt Professional blender is capable of making a lot of things. It is an all in one blender. Its thick blade can crush and pulverize ice cubes, vegetables or frozen fruits within a second. As a high-performance professional blender, you can make hot soup, sauce, different smoothies, juice and ice-cream with it. Also, you can use it as a food processor and grind coffee bins, seeds. It is easy to blend protein powder and make pudding. COSORI is a new brand but it is getting trendy to people day by day as a Kitchen Aid appliance. If you compare this branded blender with other pro blenders, I will suggest this Professional Blender. Because many users became satisfied after buying this COSORI blender. 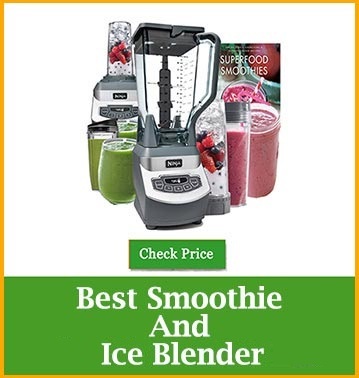 They said it was a fantastic and well worth blender in their price range. They also said that they could make any kind of drinks and smoothies without hesitation. Specially, most of them were talking about the hot soup making process. They were so much happy for having it. I always say that the best brands or products depend on you. If your budget is low and you like a high-performance food processor blender, I suggest you this COSORI professional blender. This inexpensive blender will worth your every penny. 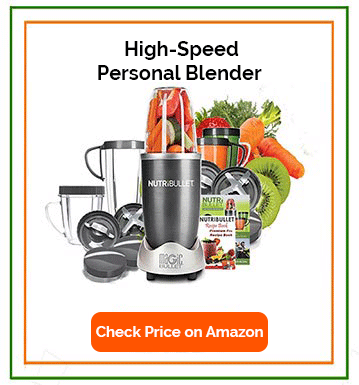 You can compare this blender with other branded blenders. You don’t need a separate blender for personal and family uses. It can fulfill all your needs. This COSORI is not only a good quality blender on your price but also a lifetime useable blender. But at the end, I like to say that before buying any product, you must collect brand information and read the customer reviews.